It's been yet another crazy week... The countdown before our move has begun, so the house looks like an obstacle course with boxes lying all over the place. You don't realize how much stuff (I was actually gonna say 'crap' lol) you accumulate until you have to haul it around! Anyhoo, the days are zooming right by. Yes, I do remember to eat, but by the time supper comes, I don't have much energy left to whip up anything fancy. Yesterday, a friend called me up saying she would like to do some raw food prep with me as she could use a bit of inspiration. Cool, the perfect excuse to take the day off and make something a little special. I opted for pizza as it is both simple and never fails to please the taste buds. I dug out of the freezer some pizza crusts, a container of pesto and Pine Nut Parmesan. I also had a fresh batch of Lower East Side Spread already made so I thought to myself: "Hey, why not?" Form into pizza crusts and dehydrate. Soak seeds together in fresh water for 2-4 hours, drain and rinse. In FP chop garlic, onion, fennel, and oregano. Add broccoli, soaked seeds and tahini, blend into a smooth paste, or leave it a little chunky. Season with salt and pepper. Toss the veggies in equal part olive oil and tamari or Nama Shoyu. If desired, add some crushed garlic. Let sit for a few minutes. First briefly process macadamias and cashews in food processor. Add the rest of the ingredients and process until well mixed. On a pizza crust, spread a generous layer of your favorite basil pesto. Follow with some Lower East Side Spread, then marinated veggies. Crumble pine nut parmesan on top. Dehydrate for 1 hour at 110 degrees. In spite of all that's going on lately, I've somehow managed to have a savory D day this week as our reserves of breads and crackers were getting dangerously low. It's no wonder... that's pretty much all we've been eating other than chocolate candy in the last little while! lol I got bold and tried a few new bread recipes, and the amazing thing is that they all turned out fabulous! I'll do my best to report in greater details in the coming days, but in the meantime, here's my favorite of the bunch: Cheflandria's Pajon Bread. It's pliable, super tasty and visually beautiful. I can tell I'll be making this one a LOT! I love this “pajon” bread. “Pajon” is a Korean Onion/Green Onions pancakes served as an appetizer. It’s delicious and finally got to eat a raw version of it. It is so good with a big salad with a sweet oriental dressing. A great compliment. If you try this, let me know what you think! Mix everything in a bowl except water, green onions and shallots. Mix well. Add 1/4 cup of water and mix. Make sure the consitency is like a soft bread batter, add more water one tablespoon at a time if needed until consistency is achieved. Soft bread batter where you can still spread the batter into the teflex sheets about 1/8 inch thick. Spread with a butter knife in a teflex sheet. Dehydrate for about 4-6 hours. It should still be soft in the middle and pliable to cut into 2×2 inch squares. Serve right out of the dehydrator with salad. Enjoy! ~ I used organic tamari instead of Nama Shoyu and sweet onion instead of shallot. ~ It was a little too salty for me so I made a mental note to cut down on the salt next time. ~ The batter took a lot longer to dehydrate, but that's probably because I used too much water. No matter... This bread was sooooooo delish!!! ~ The above recipe doesn't yield very much so you might want to double or even triple it. 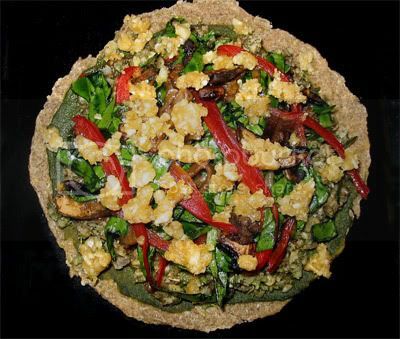 Oh, and make sure to pop by Gone Raw for more of her yummy recipe creations. So much is going on around here these days! Between my recent chocolate marathon, organizing Raw Freedom Community's First Anniversary Draw, the release of a new recipe ebook and the upcoming move, it's a wonder I find time to prepare food at all! Whenever it gets that busy, I always fall back on simple and easy dishes. As Don picked up some lovely fresh asparagus at the local market today, I jumped on the opportunity to make the following recipe Rawbie posted a few weeks back on RFC. I was planning on using some pine nut parmesan I had sitting in the freezer, but completely forgot about it. No matter, this was absolutely delicious anyways! 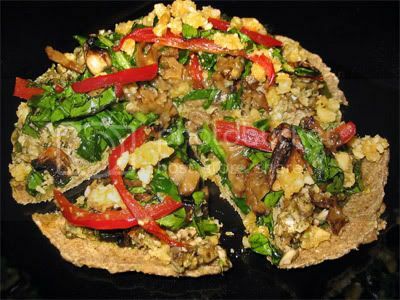 Toss the mushrooms, tamari, and olive oil together and set aside. Put the pine nuts, cashews, water, lemon juice, and agave in a blender and blend until creamy. If the mixture is too thick for the blender, add a very small amount of water (by the teaspoon – just enough to blend). When the mixture is smooth and creamy, add the nutritional yeast, miso, onion powder, garlic powder, salt, nutmeg, and pepper and blend briefly to mix. To serve, squeeze out the excess liquid from the mushrooms. Toss the mushrooms, asparagus, and pasta together well. Garnish with optional Pine Nut Parmesan. Store any leftover sauce in a sealed glass jar in the refrigerator for up to one week. Carmella's Notes: I marinated the asparagus along with the mushrooms and used part cashews and macadamia nuts for the sauce. Blend all ingredients in a high-powered blender, adding more water, if necessary, to achieve a smooth, creamy texture. For Pine Nut Cream, use as is; for Pine Nut Parmesan, spread 2 cups of the batter evenly on a dehydrator tray lined with a non-stick sheet and dehydrate at 105 degrees for 12 -18 hours, or until crisp. Scrape the dried batter off the sheet and refrigerate in a glass jar for up to 1 month. Use as a topping for pastas and salads. 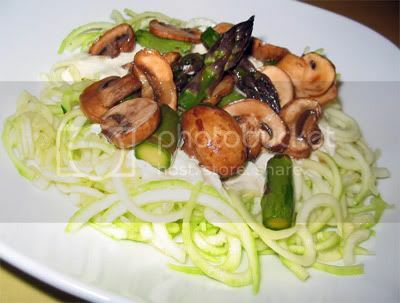 For more awesome pasta recipe ideas by Cherie Soria, click here! Gosh, it's hard to believe it's only been a little over a year since I've rediscovered chocolate. As I was mentioning in my All Things Chocolate post, Don and I hadn't had chocolate for many years when we heard the good news, that raw cacao is in fact a superfood, unlike it's infamous cooked cousin. Who would have thunk it, eh? Since then, I've been playing with raw cacao in its different forms - powder, beans, nibs, butter and paste - taking raw desserts to a whole new level. Bliss by the mouthful! 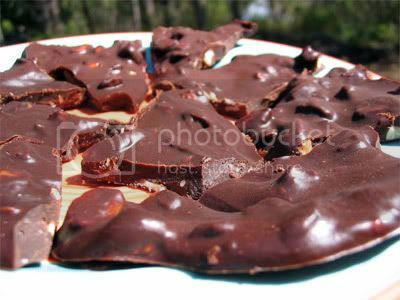 The one area I had yet to experiment with in earnest was chocolate candy. My curiosity has been increasing over the months, but I finally reached the "OK, I really gotta get into this!" stage earlier this week, when rawererin shared her latest experiment on Raw Freedom Community. No more procrastination! Fancy candy molds or nay, I took a deep breath and dived decisively in... a sea of chocolate! Of course, now I'm asking myself: "Why oh why, did I wait so long!?!" Maitres chocolatiers around the world will agree that making chocolate is a skillful art. 'Regular' chocolate is usually obtained by combining roasted cacao, cacao butter, milk, sugar and lecithin. The conventional method consists of a number of delicate steps, including conching and tempering. (See this article about "How Chocolate Works"). I have no doubt that raw chocolate making can be just as intricate a process, but I am in all respects still a toddler in the realm of chocolaterie, so I kept it simple. I've come to learn a few things along the way which I thought you might find helpful too. Coconut Oil - Coconut oil is firm at room temperature and is often used in order to harden chocolate. You can find coconut oil (make sure the label specifies that it's raw or processed at low temperatures!) at most health food stores. However, I find it can be outrageously expensive, especially when you use a lot. Cacao Butter - This is what white chocolate is made of. Cacao butter is the pure oil of the cacao bean. It melts at approximately 90 degrees Fahrenheit, which means it is even firmer than coconut butter at room temperature. This stuff is simply a-ma-zing!!! Makes for absolute decadent desserts! Cacao butter usually needs to be ordered online. 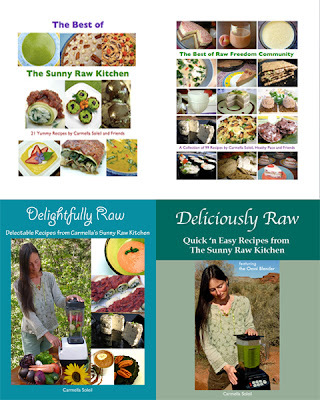 I buy mine from Real Raw Food (a Canadian raw food distributor) or Ultimate Superfoods. Cacao Powder - The most common and popular form of cacao. Again, I prefer to buy online, as my local health food store sells it at an exorbitant price. You can find it on Amazon in the grocery section: 2 16 oz pouches for $25.00! Great price! Cacao Paste - This is considered to be the best form of chocolate for making chocolate treats. (It's what my friend Chantale uses for the raw chocolate bars she sells at her raw deli.) Cacao paste is raw cacao beans processed into a super smooth consistency. It naturally contains about 50% cocoa butter. Cacao Beans and Nibs - Technically speaking, these could also be used to make chocolate candy, although it might be difficult to grind them finely enough to obtain a lovely smooth consistency. Carob Powder - Carob has a sweet taste similar to chocolate, but with less fat and calories. It can be used as a substitute for, or in combination with, cacao powder in any recipe. Sweeteners: Most recipes I've found call for either agave nectar, or maple syrup. The latter is not raw but provides a particularly rich and voluptuous flavor to the chocolate. After making rawererin's wonderful Perfect Chocolate Bar which I shared with you a few days ago, I came up with my own chocolate treat. Oh My Goodness! Can it get any better than this? It reminded me of Cadbury's Fruit & Nut bar. Mmmmmmm... I have to say that both Don and I have a soft spot for this one. 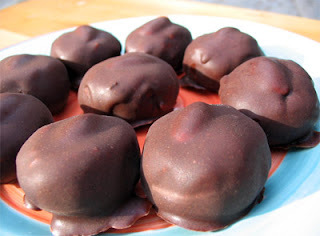 The almond extract gives the chocolate a subtle and yummylicious touch. Blend until smooth in high speed blender or food processor. Spread mixture on plate or pan lined with parchment paper and set in the fridge or freezer. You can score the chocolate with a cookie or pizza cutter after a few minutes or break into pieces once fully set. Alternatively, you can pour it in chocolate molds or little muffin pans, being careful to oil these first for easy removal. ~ The first time I made this, the mixture was solid enough so that I was able to drop it by the spoonful on parchment paper. Don and I had a piece after only a few minutes of it being in the freezer and the inside was still a bit soft. Good gracious! Was it ever good!!! Reminded us of Belgian chocolate. ~ The chocolate mixture can be blended with the help of a food processor, blender or even by hand. In the case of the latter, you might want to pass the cacao or carob powders through a sieve first to avoid any lumps in the mixture. ~ The consistency of the chocolate mixture will vary depending on the temperature of your working space. For instance, I've had it nearly seize up on me one day when our house was cool. If that happens to you, all you need to do is stick the mixture in the dehydrator for a few minutes. As I was playing Sherlock, I stumbled upon another rawified chocolate candy bar recipe: Almond Joy. The traditional version consists of a coconut-based center topped with an almond and coated in a layer of milk chocolate. I started off with chocolatestRAWberry's recipe posted on GoneRaw, but the coconut filling's texture wasn't quite right. Also, as I preferred a chocolate coating that would harden up rather than a sauce, I used the basic recipe from my Fruit & Nut bars. 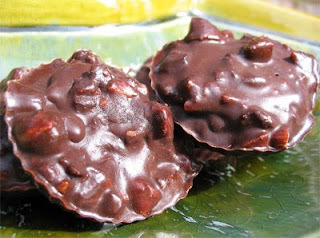 Wow, another chocolate treasure; no wonder they call it Almond Joy! Blend until smooth in high speed blender. Transfer mixture to a bowl and put in fridge to set. Once the mixture has firmed up, form into a small ball then slightly flatten down. Top with an almond and return to the fridge or freezer to set. 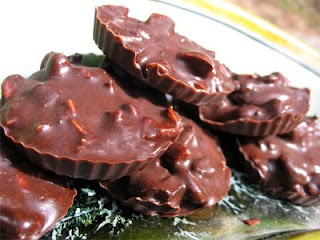 Dip each coconut mounds into chocolate coating. Allow a few seconds for excess chocolate to drip, then transfer to parchment paper. Put in fridge or freezer to set. If the Raw Almond Joy candies are stored in the freezer, make sure to transfer them ahead of time in the fridge to allow the coconut base to soften up. Makes a very large rectangular cookie sheet full, about 1/4'' thick. This recipe is highly adaptable as you can see, but it turned out really well. Combine all ingredients EXCEPT buckwheat till super smooth. You may have to periodically put this back in the dehydrator if it starts to get to stiff. Stir in the dehydrated buckwheat, start with a little, and adjust to your liking. 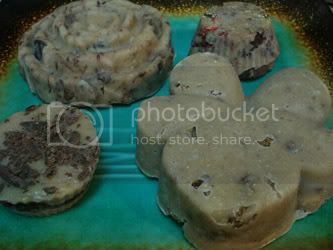 Line a cookie sheet with waxed paper and spread mixture out, or you can pour it into moulds, cover with a sheet of waxed paper and put in freezer to harden. You can score them with a cookie cutter or a pizza cutter before you put them in the freezer to harden, or about a 1/2 an hour to 1 hour after they’ve been in the freezer. This was a huge success, it has the perfect texture, crispy, smooth, creamy, sweet, and chocolatey! 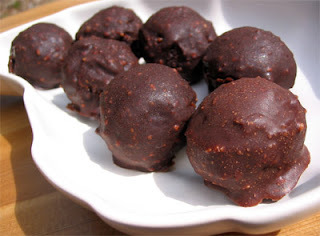 Snowdrop posted a similar recipe a while back on Raw Freedom Community, using coconut oil instead of the cacao butter. 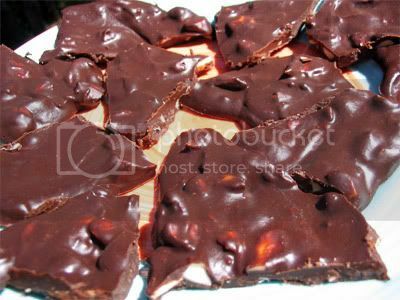 Next on the list was another recipe I've been eyeing for ages: Chocolate Mint Candy. I kept thinking I needed to get proper candy molds, but somehow that never happened. I'll have to go shopping online at this place or this place sometime. Cool chocolate mold shapes galore! This was yet another delicious candy! One of Manu's favorites! Place all ingredients in a high speed blender and blend until smooth. Pour into molds or a pan; freeze for at least 30 minutes before serving. ~ You do want to oil the molds to make it easier to get the candy out. 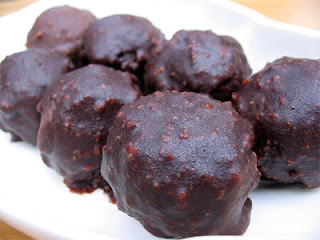 ~ I used all carob powder because I will not give my kids cacao. I also used almond butter. ~ I used about half cacao and half carob. ~ I poured the mixture in an oiled ice cube tray. Not as pretty as Tracy's, but it did the trick. All these rawified old chocolate treats gave me the idea to try to re-create my all time favorite: Ferrero Rocher. The traditional confection consists of a whole roasted hazelnut encased in a thin wafer shell filled with nutella/hazelnut cream and covered in milk chocolate and chopped hazelnuts. Ah man! I used to adore that stuff! My research turned up a couple of raw versions of nutella, which certainly was a good place to start. I opted for the one posted on Gone Raw, but it didn't do the trick for me. I'm thinking I didn't process the hazelnuts long enough to release the oils. The resulting mixture was very dry and didn't come anywhere close to the SAD spread. Hum, what to do? After a little tweaking and a touch of water to smoothen it up, I finally had something fairly decent to work with. I also put the mixture in the freezer in order to make it more workable. Next time, I might give this version a try. For the coating, I used the basic chocolate recipe I used for the Raw Almond Joy (again!) in which I folded in some finely chopped hazelnuts. Food process raw hazelnuts for several minutes until clumpy and oily. Add the rest of the ingredients. Then add water until you reach desired consistency. Place in freezer to set. Handful hazelnuts, finely chopped in food processor. Blend until smooth in high speed blender or food processor. Transfer to a bowl and fold ground hazelnuts in. Take a spoonful of raw nutella (once firmed up) and tuck a hazelnut in. Return balls in freezer to set. 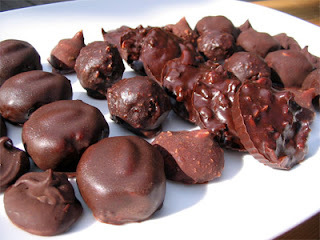 When firm, dip each ball into Hazelnut Chocolate Coating. Allow a few seconds for excess chocolate to drip, then transfer to parchment paper. Put in fridge or freezer to set. If the Ferrero Rawcher candies are stored in the freezer, make sure to transfer them ahead of time in the fridge to allow the hazelnut filling to soften up. 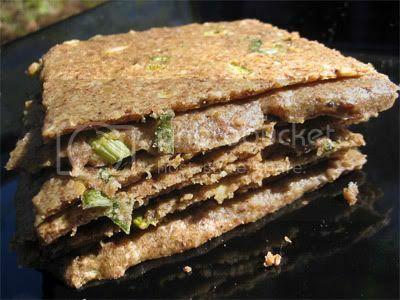 I've been drooling over the following recipe for more than a year, since my days back on Raw Food Talk. Now I can understand why Sheryl and pretty much everybody else who's made this were so thrilled. This is absolutely in-cre-di-ble! Okay here we go.... I have to say again.. this is AMAZING!!! Just amazing. The best raw dessert ever!! Better than chocolate carmel divine and easier too! It's this brilliant red/orange color, with the crunch of dried goji berries and cacao nibs. A sweet dessert, and also HUGE in antioxidants too! It actually reminds me strongly of orange cranberry desserts that are quite common in Canada. YUMMY!!! The best thing about raw chocolate... you have like 20 g and you're satisfied. We've only eaten the smallest chunk out of this fudge. Show me that happening with a regular family and a standard chocolate bar! Never!! ~ I used 1/2 cacao butter and 1/2 coconut oil and the mixture didn't set properly for some reason. *scratching her head* Could have been due to the fact that I processed it a little too much. ~ I cut down on the sweetener a bit... used more like 1/4 cup agave as I prefer it not too sweet. Since I had more white chocolate mixture than I expected and as the base is the same, I tackled the following superfood bar next. I then poured the mixture in a bowl and added by hand some lucuma and maca, as per Ginger's suggestion. Unfortunately, this one didn't set well either, but the taste was still fantastic! OMG It's A Nestle Crunch Bar!! No really, it is EXACTLY like those toxic, glow in the dark, chemicalised animal 'pus' chocolate bars... only this tastes way better!! Same texture & everything, it's amazing! Dried White Mulberries *any superfoods/superherbs you like! Equal parts agave-white cacao butter-cashews, like one cup each for example. Add a tsp of ho shou wu (fo-ti), a tbsp maca, a tbsp lucuma *IF YOU HAVE THESE*, I know not everybody does. 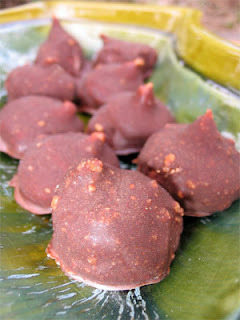 Carmella's Note: As for the previous recipe, I used 1/2 cacao butter and 1/2 coconut oil and used less sweetener. 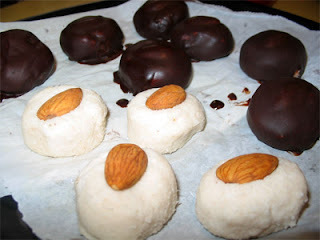 When I told Manu about my chocolate experiments, he suggested a truffle with a soft coconut center. Cool idea! However, it also presented a bit of a challenge: how to form the soft center before coating it with chocolate? (Hum, kinda sounds like the old Caramilk bar secret when you think of it. lol You know... How do they manage to get the darn caramel in there?) After some trial and error, I finally came up with a solution that not only worked, but was also super easy. *Lecithin acts as an emulsifier. Look for lecithin (preferably non-GMO), in granules or powdered form. If using granules, make sure to grind them up in a high speed blender or coffee grinder. Blend all ingredients except last two until smooth in high speed blender. Add lecithin and melted coconut oil and process some more. Transfer to a bowl or container and set in fridge or freezer. With a piper, form little 'kisses' on parchment paper. Place in freezer to set. When firm, dip each kiss into Chocolate Coating. Allow a few seconds for excess chocolate to drip, then transfer to parchment paper. Put in fridge or freezer to set. If the Koconut Kream Kisses are stored in the freezer, make sure to transfer them ahead of time in the fridge to allow the hazelnut filling to soften up. 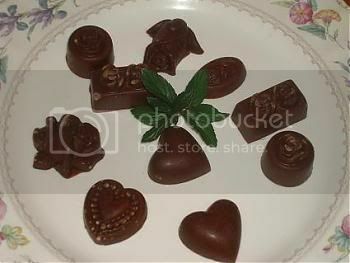 Carmella's Note: I used left over Hazelnut Chocolate Coating to make the 'kisses' in the above picture. *Lecithin acts as an emulsifier. Look for lecithin (preferably non-GMO), in granules or powdered form. If using granules, make sure to grind them up in a high speed blender of coffee grinder. If the Hazelnut Kream Kisses are stored in the freezer, make sure to transfer them ahead of time in the fridge to allow the hazelnut filling to soften up. Finally, no post on chocolate making would be complete without a few words about cacao paste. I was telling you how this is what most professional chocolatiers use, as the smoothness it lends the chocolate is far superior to what you could achieve with cacao powder or home ground nibs or beans. To make chocolate bars or candies, simply melt cacao paste in a dehydrator or with the double boiler method on low heat, stirring constantly. Add agave nectar until desired sweetness is reached. Add whatever flavorings you want. 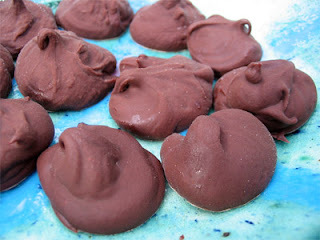 Pour into chocolate molds, drop by the spoonful or spread on parchment paper. Set in the fridge or freezer for 20 minutes or so. Voila! You've just made your very own scrumptious, professional looking chocolate treat! Say it With Raw Chocolate! Wow, this has turned into some chocolate marathon! After 3 days straight of being in chocolate up to my elbows, I'm getting dangerously close to overdosing. lol See, I wanted this post to be out in time for Mother's Day, and I've made it! Yippee! All that's missing is cute little metallic paper cups, and you're all set for the most rawesome Mother's Day gift ever! I didn't get a chance to play with chocolate at Easter (unlike last year's Choc-A-Fest), but I sure am making up for it now! 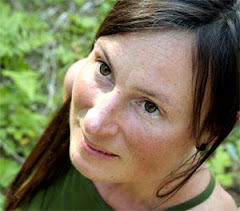 During the week, rawererin shared on Raw Freedom Community what she thought might very well be "the perfect chocolate bar". Didn't take much convincing for me to go ahead and see for myself. And you know what? She wasn't kidding. Chocolate lovers beware... this is total heaven in your mouth! Blend liquid ingredients until super smooth. You can add more sweetener or more chocolate to suit your tastes. Spread on a plastic wrap lined plate or dish and place in freezer to cool. ~ I used less maple syrup as I prefer it not too sweet. Yum! Yum! Yum! ~ You can score the chocolate with a cookie or pizza cutter after about 1/2 an hour to 1 hour after it's been in the freezer or break into pieces once fully set. Still don't know what to offer for Mother's Day? 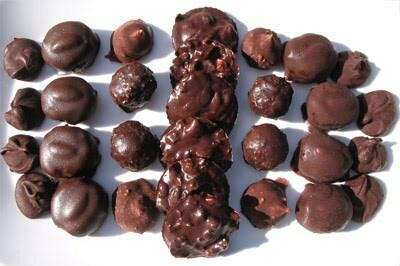 Coming up next on The Sunny Raw Kitchen is a feature on raw chocolate candy making!